PML-N leader Nawaz Sharif made financial gains of $418 million during his twice stints as Prime Minister of the country, according to a book entitled Capitalism’s Achilles Heel by Raymond W Baker. The book is a dossier on the corruption of most dominated political families in the history including Nawaz Sharif and how they accumulated their properties, factories and enormous wealth. According to the book, at least $160 million were pocketed by Nawaz Sharif during his first stint as the Prime Minister in the 1990, from a contract to build a highway from Lahore, his home town, to Islamabad, the nation’s capital. At least $140 million in unsecured loans from Pakistan’s state banks. More than $60 million generated from government rebates on sugar exported by mills controlled by Mr. Sharif and his business associates. At least $58 million skimmed from prices paid for imported wheat from the United States and Canada. In the wheat deal, Mr. Sharif’s government paid prices far above market value to a private company owned by a close associate of his in Washington, the records show. Falsely in?ated invoices for the wheat generated tens of millions of dollars in cash. Under Sharif, unpaid bank loans and massive tax evasion remained the favorite ways to get rich. Upon his loss of power the usurping government published a list of 322 of the largest loan defaulters, representing almost $3 billion out of $4 billion owed to banks. Sharif and his family were tagged for $60 million. Like Bhutto, offshore companies have been linked to Sharif, three in the British Virgin Islands by the names of Nescoll, Nielson, and Shamrock and another in the Channel Islands known as Chandron Jersey Pvt. Ltd. Some of these entities allegedly were used to facilitate purchase of four rather grand flats on Park Lane in London, at various times occupied by Sharif family members. In 1999 Musharraf had Sharif probed, tried, convicted, and sentenced to life in prison, but then in 2000 exiled him to Saudi Arabia. Twenty-two containers of carpets and furniture followed, and, of course, his foreign accounts remained mostly intact. Ensconced in a glittering palace in Jeddah, he is described as looking “corpulent” amidst “opulent” surroundings. SHAME on this kind of ANSWER..Mr U AKHTER……. tumharay jisay log hi baad mein bohat rotay hain zardari ager bada chor hai to nawaz sharif chota choor hai ……………….. tumhare country mein koi aisa insan nahi hai ko corrupt na ho…… tum logon ne phele baday chor ko vote de dia aur ab chotay chor do vote deina chahtay hooo………… hamari awam hi farig hai………. aik laptop aur pullon pe vote cast kar dete hain…………. shameless citizens ………. iss liye to nawaz sharif jaisay log apko road bana kar de rahay hain aur laptop jis pe blue films dekho …… 🙂 khud hi socho jo student MA Punjabi par raha hai usko kiya zarorat hai laptop ki ……. is it a race of corruption ..? stints means a fixed time period. Greeds knows no boundary. Prophet, SAW said to the effect that man's desires are fulfilled only by the sand of his grave. Only a Pathan Army Chief and Pathan Preseident will them, Punjabi is good for Yes, Sir profession. It is the Punjabi establishment that has eaten up the Country, Pakistan needs Jewish or Hindu Judges to put these Politiclowns in Maach Jail. Lol… do you think a foreign writer will watch, translate and understand the mubashar lucman show to write a book??? Y dont #NawazSharif take legal action against ML or this writer? They are not the most corrupt politicians of the country. Great we have the choice between the crooked Zardari and the crooked Sharif. I bet privately they have a competition to see who robs the most from the poor. PRAY TO SAVE THE COUNTRY FROM AZAAB.E. ALLAHI WHICH IS ALREADY ON DOOR STEP. These corrupt politicians are criminals and should be hanged in Islamabad. Nawaz Sharif and Zardari are both corrupt and both should be executed for TREASON against the people of Pakistan. No to PPP. No to PML. No to NATO overflight. No to any relations with America. American Dollars are causing the problems in Pakistan. LOL !!! How come a currency causing problem in Pakistan???? Economics. When the supply of money increases, but the production does not increase.. inflation increases. If you know what it means. He should never return to power otherwise he and his extended family will once again rob Pakistan. I already had no doubts about him. Now reconfirmed. Nawaz is done. He is history. This coming election is his last stand. He has been the biggest supporter of zardari. His support has kept ppp in govt. for the last four years. Zardari totally out smarted him and the bald headed joker still doesn't jnow what happened. We will need a bigger and thicker rope for his neck. Zardari is corrupt, Sharif is corrupt Imran Khan will soon join then when he gets in power. let him get in power first…………dont assume……….by the luks of it the way he is kept AWAY from power that very forces r scared of his INTEGRITY. What a thief! there’s nothing left of Pakistan! It’s fate is only corruption! Abuse of power! N droned regular by the bigger thiefs America!! What is intriguing is why Nawaz Sharif has abandoned his policy of restraint vis-à-vis the PPP-led government, a restraint informed by the bitter experience of the military taking advantage of the politicians’ falling out to intervene and pack up the democratic system altogether. 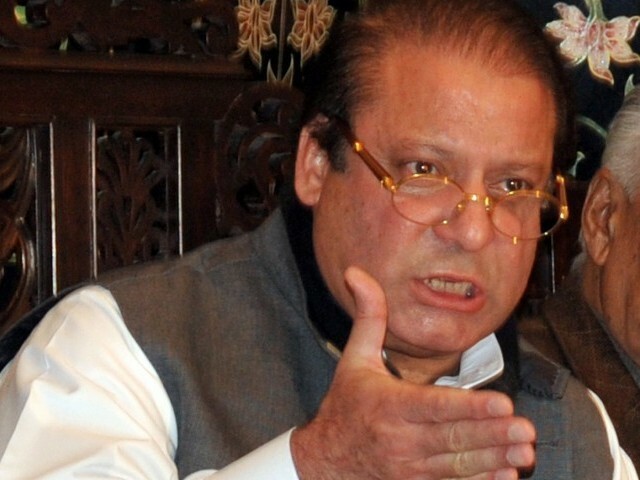 The restraint shown by Nawaz Sharif over the past four years may have earned him the sarcastic jibe of acting like a ‘friendly’ opposition, but it now appears he has allowed himself to be persuaded by the hawks in his party (led by Chaudhry Nisar and backed up by younger brother Shahbaz Sharif) to go all out against the government. The timing of the change is also intriguing, given that the country is in the run up to general elections. The opportunity for the turn has been presented by the contempt conviction of the prime minister by the Supreme Court but the PML-N has displayed its impatience with the legal and political process to be gone through before the verdict can take effect. Nevertheless, the argument that a street agitation may destabilise democracy, if not provide once again an opportunity to anti-democratic forces to wrap up the system per se has not lost its validity, historically or at the present conjuncture. imran god father mosharaf 8 year why did.t take action about that? Because this is only prapoganda .so i bealeve and trust from my deeeeeeeeeeeeeeeepheart on sharif bro. STOP THIS ………FK……NON……. please do not blame Imran for the mistakes of Musharaf. bottom line is Nawaz Sharif and zardari both are corrupt. Nawaz Sharif looks like a thief from his face. One really laughs out loud when Mian Nawaz Sharif talks about corruption of others. He himself is the champion of corruption and still facing such charges and interestingly he has not been declared innocent in any of the case unlike Asif Zardari, who has been given clean chit by Judiciary after facing these charges for 11 years. Mian Sahib you even don’t have heart to face genuine charges for one year and I am sure you would lose your life if even put behind bars for one year. One should look into its own mirror before point finger towards others. Can you deny the following facts and figures? 8.8 Rs. 239 million were loaned to Ittefaq Brother. 9. The Nawaz family which is now one of the richest in the country largely due to the largesse of Pakistani banks has unveiled its one billion rupee Raiwind Complex. Spread over an area of around a thousand acres it houses palatial residences, a 300 acre farm, a 500 bed hospital, a school, a medical teaching facility, 200 acre dairy farm, a 350 line telephone exchange, Polytechnic institute, Nursing and Midwifery school etc. The Sharifs who must really be minting money have built it all in 17 months at a cost of Rs 740 million. The Punjab government headed by a Sharif has chipped in by providing government-funded roads and forcibly purchasing land for papa Sharif. Isn’t it that pot calling the kettle blak? What would that accomplish? The facts are there if they are really facts. The question is what to do about it now–not after election. Pakistan seems tb ruled by a mafia of some sorts. It stinks at all levels! Tried and tested thugs and shameless power grabbers only to loot more! keep them at the bay, vote them out, kick them out. Vote only for the best sincere people! Mentally challenged people like you must not be allowed to comment. This can't be true. He has been for so many Hajjs and umras, plus he has spent a long time in the birthplace of Islam. This and Much other corruption which didn't came on surface may amount to figures like in Billions becuase Corruption can't be measured if done in many mays and methods. i really hate Nawaz and his followers for creating illusions and causing loss to the Country . Vewry Corrupt Mafia Pls be aware of them now the things are on surface. Why doesn't Nawaz Sharif sue Raymond Baker ? Serious serious allegation and Mr Sharif is quiet like a mouse. written by Inam R Sehri and recently printed in UK; go to amazon. Is there any one who can summon him for this to explain his position? ALL KACHRA DIRT OF NOORA NAWAZA AND SHOWBAZ SHARIF, ZARDARI MURDARI, ILTAF HUSSAIN BADMASH, ASFANDIAR WALI INDIAN AGENT ,FAZLUREHMAN DIESEL AMERICAN AGENT SHOULD BE REMOVED SAVE PAKISTAN. He is not only a corrupt to core but also a non trust worthy person. Ask Arabs who were guarantee in his deal with Musharraf for 10 years out of politics and country but he cheated on Arabs and backtracked on a written agreement and came back to Pakistan. Any time we talk about the politicians like Sharif's or Zardari,Benazir and others,we mention corruption and how they must or should pay,well they are also very powerful,deep rooted so in reality they will never be touched because the money trail goes too far down.All we can ever do is talk about it show our displeasure and then on election day elect the same bad apples and years down the road talk about it again.Thats why the Sharif's are still here,Zardari is still the President of Pakistan,the "UNTOUCHABLES"
According to the writer of this book information was given by rehman malik who is jhoton ka IG name given by imran khan. nawaz has corruption written all over his face, the guy breathes and eats corruption. Biggest idiot and crook. Nawaz Sharif is worth US$ 2 to 3 billions. Let NAB reopen all cases lying closed for the last five years presumably under a deal with Mr Zardari and earlier under a deal with Mr Musharraf to find out the facts and figures. Why is NAB keeping a lid on those cases but punishing others who have no political clout? Will Admr (r) Bokhari please answer it. He was head of 'Save Pakistan Coalition' with Good Governance Forum before he became NAB's chairman. He probably forgot to save Pakistan after his appointment in NAB. Let the State Bank of Pakistan open up all cases of bank loans since the privatization of Ittefaq Foundries under President Zia-ul-Haq tenure and come up with the truth. We must know the truth this time before the people go to polls. Enough is enough. BUT WHAT WILL BE HIS FATE…?? ?NON HAS ABLE TO TAKE LOOTED OR LEGITIMATE MONEY WITH HIM….???? ALEXANDER THE GREAT IS THE BIGGEST EXAMPLE..?? “Nausarbaz” Nawaz sharif declared his farm house consisting of 2500 kanals at Raiwind and at Muree as Prime Minister house in addition to a PM house at Islamabad and so a “teeka” of 500 million rupees inflicted on this poor nation on name of austerity!! He will not use flag (afraid of terrorist attack) costing Rs.100 only on his motorcar costing Rs. five crores on name of austerity. Height of “nausarbaazi”. All Politics Leader are corrupt. I donot understand why the people of Pakistan are given the choice to vote for corrupt politicians,Who will bell the cat?Let us see how much Amir ul UMora will collect this tenure ,already Nadinpur power project is having Rs15 billion kickback news.How moch land money and power a man needs to become honest.Greed is moral diesce which has no cure. Mr. Nawaz Shareef Carried 22 containers of carpets and furniture to Jeddah for a stay of 10 years, now let's see how much goods he would be able to carry to stay in the other world after death. All those corruption situations must to be brought to the surface and the guilty persons to pay for their mistakes.